With Vive, HTC offers one of the best VR solutions available. But at around $799, it's also one of the priciest. We just received the VR headset in the office and have been busy installing the system. This is no small feat - setting up Vive is far from simple. In this article, we'll show you what to be careful of, what problems may surface and how you can solve them. Installing HTC Vive may cause great frustration. Unlike Daydream or Cardboard headsets, here we require some hardware and software which produce distinctly better quality. Even we had issues with the setup, encountering certain problems along the way. To help you get around this frustration and come sooner to exploring the depths of fun it has to offer, we're going to show you the problems that can occur and what to look out for. It's worth using these tips to get the setup process out of the way and start enjoying the VR as soon as possible - the payoff is amazing. HTC Vive Setup: what requirements need to be met? The first crucial point here is obvious. You need a powerful PC to play Vive. It's important to make certain things clear here that are not necessarily evident from the outset. We were fortunate enough to receive a suitable backpack-PC along with our test Vive system. Thanks to the fact that the PC is equipped with an Nvidia GTX 1070 GPU, it has very good graphics card. In addition to a strong GPU, the CPU must also fulfill certain requirements. 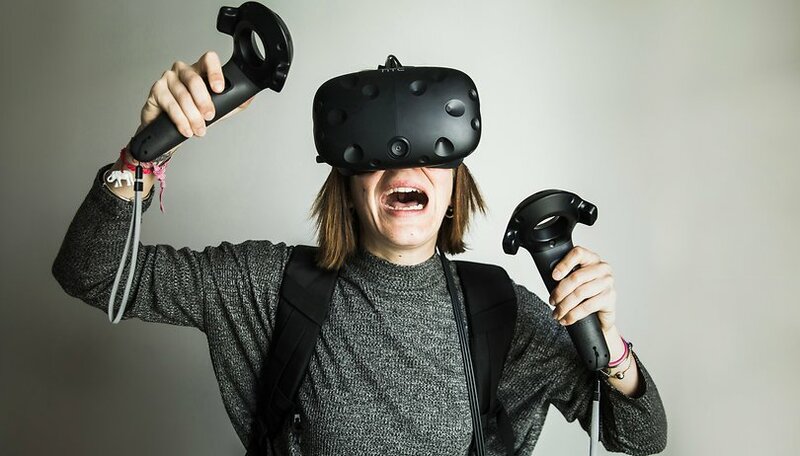 When purchasing hardware, you can clarify whether it's adequate to operate an HTC Vive. The minimum requirements can also be found on the official HTC Vive website, where you can also directly test your PC. However, our backpack-PC for Vive does have a weakness. This can be found among many notebooks: the number of connecting ports isn't particularly high. To use HTC Vive, you'll need two HDMI ports (or one Displayport port) and one USB 2.0 port. These HDMI connections can quickly become an issue. Unfortunately, our PC only has one - a Displayport port on its side. We used this to connect a monitor, which is where the problem begins. Both displays, the HTC Vive and the external monitor, must be connected directly to the graphics card, otherwise Vive may fail. Why? We haven't found an explanation thus far. This problem had the effect that Vive initially didn't work for us at all. Only after multiple new installations and changing the USB 2.0 connection to a 3.0 model did the headset finally display a picture. This issue has been discussed extensively on several platforms - including Steam and Reddit, where you can also find various solutions. In certain cases, it can take a little while before Vive performs as it should. But don't give up - it's worth it! Following the cable setup, initiating the software is quite simple. The HTC-software guides you through all the important steps. At this point, you'll be explained the important components and functions of the system. Thanks to the assistant, connecting the hardware is very fast and simple. The number of cables is large, but you quickly realize where each one goes. The necessary StreamVR app is also installed automatically at the setup. This app allows you to purchase and install games. There are normally no issues here. Only when the headset is supposed to be connected and installed can this quickly lead to error messages. Steam is aware of these and maintains a very informative website to address and solve the most common issues. This site also helped us with other miscellaneous problems. Even the product handbook is available online and can provide important instructions during the set up. Once everything is installed and the headset has been recognized, the playing space needs to be measured. Even here, HTC has put some thought into creating a clever and funny animation. A small figure springs into the room and shows you what exactly you need to do. After that, you're done and ready to play your new HTC Vive! Setting up HTC Vive: worth the effort? We come back to our original question - is the installation worthwhile? This I can only answer with a categorical 'yes!' - and how! Already in the first few minutes it's clear that the device brightens your mood. I couldn't wait to install a game and so started directly with the pre-installed VR demo from Nvidia. In this game you stand inside a circus and complete various mini-games, including archery, basketball and knocking down cans. The games don't become more complicated, but are surprisingly good fun. Sure, this is normal for the first few minutes of the VR experience, but it shows how interesting the new technology really is. You quickly forget about the surrounding room, and noises from outside can be annoying as you simply don't expect them (I initially used the headset without headphones). The first few minutes of playing with the HTC Vive make up for the hours of difficulty and frustration involved in setting it up. You forget immediately how annoying the installation actually was. Vive is still so novel that you're simply blown away, even without playing it intensively. Many colleagues stopped by and asked when they could try out the system. The first impression is great. The picture quality is many times better than Daydream or Cardboard headsets. Playing the system is amazing fun from the first minute and you quickly lose track of time. All in all, the VR experience itself is excellent, but the process of setting it up is a little annoying. Our system still isn't running at 100 percent. We still receive error messages and games sometimes don't end or start properly. At these moments, things begin to feel somewhat 'beta'. We'll play around further with the settings and see if we can get it to run without any problems. But all of these intricacies and small problems still don't stop you from wanting to use the system. Don't give up - Vive is simply too fun for that. We're going to put the HTC Vive through its paces over the next few weeks. We'll keep you updated as to our impressions, problems, and any surprises we run into. We're all very excited. After all, not everyone can play games in their office, right? currently in UK it's £750 ish and I'd need a pc.. so no. but I'm really excited to see where this tech is going, in the future we're all gonna literally be in a movie..